Should you invest in commodities despite falling prices? Experts suggest you take a cautious approach and invest in commodities that are fundamentally strong and trading close to the cost of production. The past few months have been harsh on commodity investors, most obviously on those with a stake in gold, silver or oil. Had you invested in gold in January 2013, you would have lost one-tenth of your investment. Gold fell from Rs 30,600 for 10 gms in January to Rs 27,600 in June. Return on gold exchange-traded funds (ETFs) was the worst affected among all gold-related investments for the period January-April 2013, losing about 16% value due to the sharp fall in gold prices on global exchanges in mid-April. The metal fell 9% in one day in April; it is down 20% since reaching a high of $1,800 in August 2011. Aram Shishmanian, CEO, World Gold Council, says the fall was triggered by speculative trading in the futures markets. Silver prices tend to mimic the movement of gold, albeit with a higher beta (a measure of volatility). 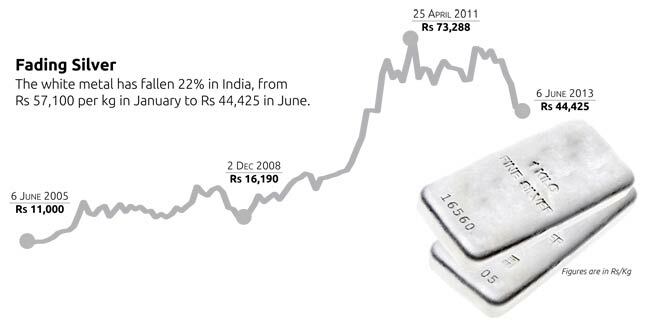 Silver fell from $28 per ounce to $24 in mid-April globally while it lost 22% value in the domestic market, falling from Rs 57,100 per kg in January 2013 to Rs 44,425 in June. Kishore Narne, head of commodities, Motilal Oswal Securities, says fewer investors are searching for safety in this asset class. Gold, due to its role as a hedge against risk, has returned 18% (CAGR) in the past 10 years-the highest for any asset class. Yet, investors have stopped relying on gold with the waning risk of financial crisis in the US and Europe and lower global and domestic inflation. Though it has industrial uses, the price rise is justified only if financial demand, via ETFs, is factored in. Gold-backed ETF holding demand fell by 13 % in the first four months of 2013. SPDR Gold Trust, a large holder of gold globally, saw demand fall by 20%. This fall in ETF holdings, along with expectations that the Federal Reserve (Fed) will withdraw monetary stimulus, added to the fall in prices, explains Naveen Mathur, associate director, commodities and currencies, Angel Broking. Despite the steep fall in the global price of gold, India has not been affected as much as other countries. "The fall in gold prices in India has been masked by the depreciating rupee and the full effect of the fall has not been passed on to investors," says Narne of Motilal Oswal. Gold has dropped 20% in dollar terms but only 10% in rupee terms. Much of the ETF liquidation has been absorbed by demand for jewellery and from the retail investment sector in India, China and South-East Asia. Although ETFs account for a small portion of gold demand (6.5% compared with 72% consumer demand), the ETF market and the futures market have a direct impact on prices of the precious metal. In fact, India imported about double the normal volume of gold (162 tonnes) in May, when the price fell. This was followed by an increase in import duty from 6% to 8% to slow imports, which resulted in a difference of 9.24% between international and domestic prices. But, prices will again fall in line when the rupee appreciates. Owing to these factors, Narne recommends a maximum investment of 10% of your investments in gold, that too as an insurance against the depreciating currency. The fall in prices was not limited to gold and silver. In mid-April, crude prices also fell below $90 a barrel and copper dropped to a 17-month low. "Though the economy is showing signs of recovery, growth of oil supply has surpassed growth of demand. This has caused the price of oil to correct," says Narne. US crude oil inventory is at its highest since 1931. Further, the shale gas boom in the US, combined with OPEC production and insignificant recovery in Asian markets such as China and India, has caused prices to slump. WTI (West Texas Intermediate) Crude is expected to stay between a broad range of $87 and $97 for some time. Base metals have been affected similarly. Mathur of Angel Broking explains, "Since the start of the year, significant increase in production has resulted in rise in inventory levels, while growth of demand has been weak." This has been exacerbated by the slowing economic growth in China. Rallies in prices of base metals in the recent past were associated with major infrastructural developments in China. The forecast for base metals is largely bearish. Long-term investors can use the decline in gold prices to buy the metal a bit at a time, advises Mathur. Expect prices to correct further to about Rs 25,000 per 10gms in the next three months. Hence, investors could buy at these levels with expectation that prices will go up to Rs 29,000 per 10gms. While silver prices are expected to rise to between Rs 48,500 per kg to Rs 53,500, investors can invest in futures at or below Rs 40,000 per kg with a three-month target. Narne recommends investing in commodities such as Nickel, Zinc and Aluminum, which are fundamentally strong and trade close to the cost of production. Narne says that the crucial factor for investment-grade commodities such as gold and silver is the US Fed's move to reduce the liquidity it has been providing. This mean inflation will no longer be a factor and cause prices to fall further in the international market. It also makes it costlier to hold these commodities due to a higher opportunity cost (the loss owing to not investing in a better performing asset). As the economy recovers, other asset classes would provide better returns than these safe options. Further, the Feds pulling back its easy monetary policy would support the dollar index and a stronger dollar would put pressure on commodity prices, says Mathur. Commodities follow an inverse relationship with the value of the dollar. This is because commodities are priced in dollars. When the value of the dollar drops, it takes more dollars to buy commodities and inversely. Just as important is the movement of the rupee with the dollar. The currency has been under pressure due to economic factors such as high inflation, burgeoning current account deficit, high gold imports and so on. In fact, the only factor helping the currency is foreign institutional investors (FIIs), but this too seems to be waning. FIIs have taken out $4 billion from debt funds in the past few months.